Bellingham architect Alfred Lee was a native of Missouri and reportedly arrived in the Pacific Northwest via the Oregon Trail in 1848. After his father died of cholera on the Snake River during the journey, Lee and his mother, younger brother and sister settled in Yamhill County, Oregon. While there, he apprenticed as a wagon-maker, quickly mastering his skills as a mechanic. By 1874 he had married and moved his family to Forest Grove where he opened his own carriage and machinery shop. Around 1890, Lee moved to New Whatcom, most likely spurred by promoters who advertised the community as a “town of opportunity for men with ambition.” Lee's ambition fit this bill well and by the time he moved to Bellingham he had changed his career and began billing himself as an architect. Competition was fierce. At the time, the community had several advertised architects including William Cox, J.C. Ferguson, A.E. 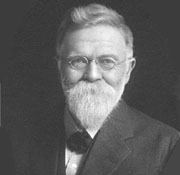 Jones, W.A Riche, C.F. White and the firm of Taylor & Moller. Another firm, Barrett & Crestwell, operated in Fairhaven. Reportedly Lee had studied architecture on his own and apparently was a quick study. Despite his lack of training, he began to receive many important commissions soon after his arrival. Among his first was a design for grand city hall for the City of New Whatcom (1892). The Late Victorian style structure was a high profile building and other commission by some of the areas political and social elite followed. Notable is his association with the construction of the Robert & Etta Morse House (1897). The house was derived from architect George Barber’s 1891 Cottage Souvenir No. 2 pattern book (design no. 33), but Lee served as the local supervising architect and adapted the design slightly to fit the needs of the Morse family. Other residential projects included the George & Cora Burke House (1903); the Dr. William & Frances Axtell House (1902); the Bloedel House (1903); Mayor Alfred L. Black House (1905); the George C. Dellinger House (1905); the Bernard & Anna Monatgue House (1907); and the Victor & Effie Roeder House (1909). Known commercial, educational and religious projects include the Bellingham Warehouse (1901); Columbia School (1901); Whatcom High School (1903); the First Congregational Church (1903); St. Joseph’s Hospital; the YMCA (1906); a remodel of the Victor Block (1908) and an addition to the State Normal School addition to Administration Building (1913). Around 1913 Lee quit his architectural practice and resumed his mechanic’s trade, this time making and repairing gasoline engines in a shop at his home. His shop was one of the early automotive works in Bellingham. Highly skilled, Lee held an early patent on a combustion engine, issued in 1916. Lee passed away in Bellingham on December 19, 1933 and is buried at Bayview Cemetery. “New Addition is Built at Normal” Bellingham Herald, August 9, 1913. US Patent No. 1183470 “Explosion Engine” - issued May 16, 1916. Obituary – Bellingham Herald, December 19, 1933. “Bellingham Beautiful Home Series – No 47” Bellingham Herald, August 24, 1907. “Architects Plan Many Beautiful Residences” Bellingham Herald, March 3, 1905. “Architect Lee Wants Pay For Plans” Bellingham Herald, August 4, 1918. “Victor Block To Be Remodeled at Cost of $6,000” Bellingham Herald, October 13, 1908.